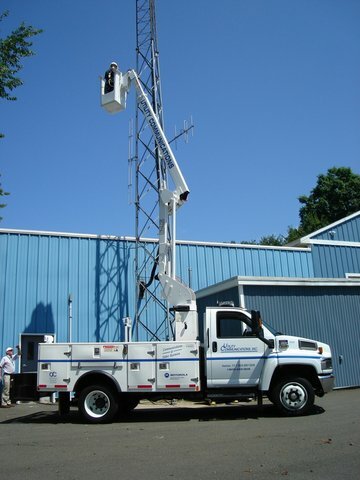 Tower Services Hamden Connecticut Utility Communications Inc.
Utility Communications constructs towers throughout the Northeast for two-way radio, cellular phones, municipality communications, and PCS operation. Installation of these structures requires highly trained crews and specialized equipment capable of reaching heights over 500 feet. Professional crews and engineers are insured andbonded for climbing towers, and each installation follows stricttechnical and safety standards. Industry leaders nationwide recognize the quality standards used by Utility Communications. Utility Communications Tower sites are constructed to provide protection from harsh weather, such as wind, lightning, temperatureextremes, snow and ice buildup. Utility Communications shows a concern for the environment by conducting its operations in a reasonable manner relative to environmental, health and safety issues. A customer’s investment is then maintained through Utility Communications Comprehensive Service Program.